MultiDeco is a decompression program that uses the Varying Permeability Model (VPM-B) and the Bühlmann (ZHL-16) for decompression profiles. The VPM-B decompression model is well suited to today's technical diving. The deco profiles will start deeper than traditional models and account for micro bubble growth and keep overall supersaturation lower, and giving a better overall decompression. 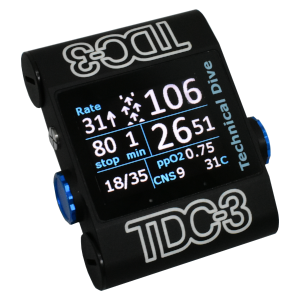 MultiDeco-TDC is installed in the Technical Dive Computers TDC-3 model. 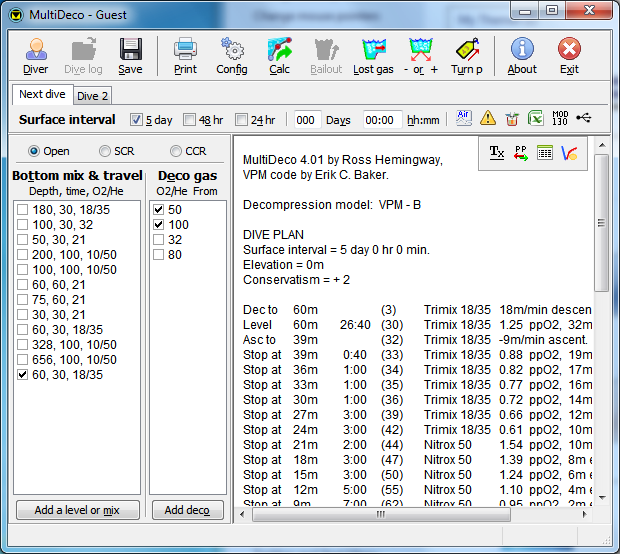 The dive computer's firmware is aligned perfectly with the MultiDeco planning software. This continuity across the dive platforms, gives a consistent result between the surface planning and the actual dive. Plan your dive, and dive your plan. The VPM model is the most widely used bubble model by tech divers today. MultiDeco calculates all types of Nitrox, Trimix, TriOx, HeliOx, OC, SCR, CCR, RB80, KISS and multilevel dives. MultiDeco makes plans for Lost deco gas, Turn pressures, Range plans, RB bail outs, watches and warnings. 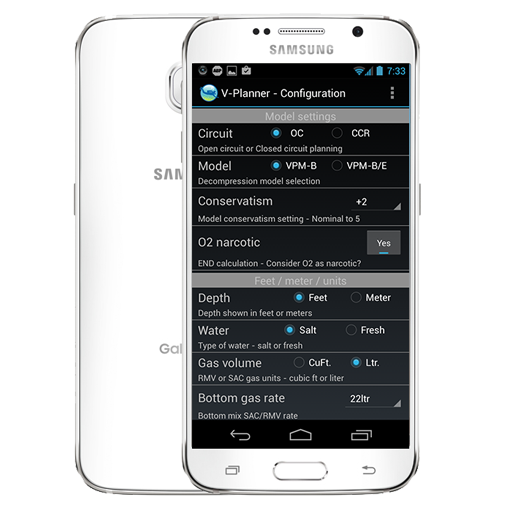 Includes Gas Mixer, Turn pressure formula, Layouts for saving complex dive plans, Graphs, data export, etc. The settings allow for customized deep and extended stops, control stop times, airbreaks. MultiDeco is available for PC, Mac, Android, iPad, iPhone. The Bubble models and similar deep stop profiles, have become the standard for technical and deep diving, with many training agencies including bubble models into thier courses. The VPM bubble model uses math to simulate and measure micro bubble growth, and set limits accordingly. The output of a bubble model is similar to many established deep practices such as Pyle Stops, Florida cave practices, DIR, ratio deco plans and others. In VPM, ascent ceilings are determined on allowable gradients for bubble formation rather than M-values. These super saturation gradients are determined by tracking sets of VPM nuclei (bubble seeds) of a certain initial critical radius. These are the microscopic physical structures that stabilize free phase gas and that can grow into full fledged extravascular bubbles when the super saturation gradient is sufficient to probe the laplace condition for bubble formation. Please note - this program is made with the experienced and technical diver in mind. 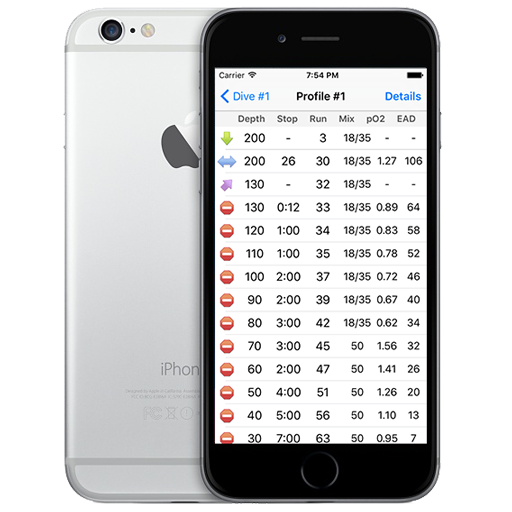 If you're relatively new to diving, you may find this program difficult to use. You're expected to know the theory behind the diving practices and procedures used here. 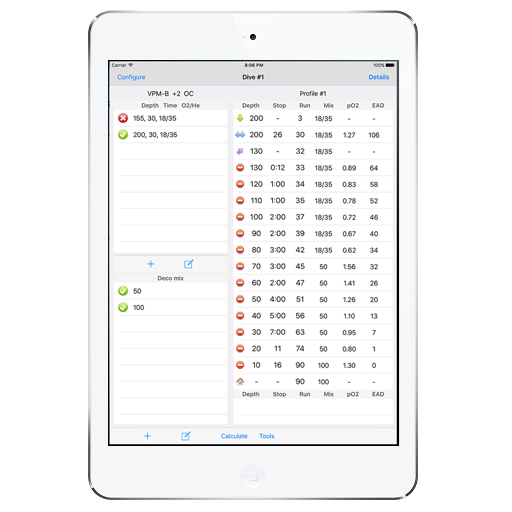 The author and HHS Software Corp do not warrant that this program accurately reflects the Varying Permeability Model algorithms, or that it won't get you bent or dead, or that it will produce safe, reliable results. This dive schedule is experimental and you use it at your own risk. Diving in general is fraught with risk, and decompression diving adds significantly more risk. Deep diving utilizing multiple gasses, including helium, or rebreathers is about as risky as it gets. MultiDeco and the decompression schedules it produces are tools for experienced mixed-gas decompression divers ONLY. If you have not been properly trained in mixed-gas decompression diving by an internationally recognized technical certification agency and/or don't have a firm handle on decompression planning and mixed-gas diving, then DO NOT USE THIS SOFTWARE.